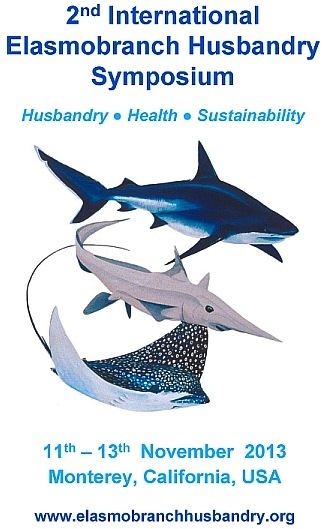 The 2nd International Elasmobranch Husbandry Symposium is slated to be held November 11-13, 2013 at the Monterey Bay Aquarium and the Plaza Hotel. Early-bird registration discounts expire August 20th. The first symposium was held some 12 years ago, October 2001, in Orlando, FL. No doubt a lot has changed since then. One look at the Elasmobranch Husbandry Symposium’s program for 2013 or the presentation abstracts (pdf downloads) is all it takes to realize that this conference is the must-attend event of the year for anyone involved in shark care and shark propagation, especially because it might be another decade before the next gathering of elasmobranch experts and aquarists! Education, outreach and advocacy. Of greatest importance is the transparency and free exchange of information that this effort has created; you don’t need to work at a public aquarium to download the Elasmobranch Husbandry Manual. For the three days of 2013’s symposium, three main themes are planned. Unlike most aquarium hobby conferences, where talks are given for an hour, the bulk of presentations planned are slated for only 15 minute session. This format allows for much more diverse offerings; if a particular topic is of no interest to you, just wait 15 minutes for the next one! Day 1, Monday, November 11th, focuses squarely on sustainability. With presentations such as “Sand tiger shark, Carcharias taurus, reproduction: a framework for a captive breeding program”, “Reproductive success of smalltooth sawfish (Pristis pectinata) at Atlantis, Paradise Island, Bahamas” and “Reintroduction techniques and short term post-release survivorship of captive reared largetoothed sawfish, Pristis pristis“, it is readily apparent that captive breeding is an integral part in the sustainability of having captive shark populations. Day 2, November 12th, the first 3 of 4 sessions are devoted to health. Useful topics like “Elasmobranch quarantine” and “Elasmobranch mineral and vitamin requirements” go a long way towards heading off disease issues. “Emerging diseases of aquarium elasmobranchs” and “A survey of voltage in aquaria housing elasmobranchs” seem to go beyond the fundamentals, keeping attendees up to date with current information. Day 2 ends with the first session on Husbandry. We wouldn’t miss Tuesday evening’s “Land transportation of whale shark (Rhincodon typus)”, “The rescue, rehabilitation and release of a whale shark (Rhincodon typus) in the Arabian Gulf”, “Whale sharks (Rhincodon typus) at the Georgia Aquarium”, and “Notes on the husbandry of captive whale sharks, Rhincodon typus“. While we all marvel at the advances of private aquarium coral husbandry, imagine the leaps forward that come into play with public aquariums maintaining the massive Whale Shark in captivity. Given the recurrent theme of Day 1 (obviously breeding), might we see “Reproduction in captive Rhincodon typus” by the time the 3rd Symposium rolls around? The elasomobranch husbandry theme continues through the final day, Wednesday, November 13th, with an emphasis on the role of public aquariums connecting the public with the sea. Kicking off the presentations is “What and how do we tell the public about the global plight of sharks and rays?”, followed up by two offerings on captive Manta Ray (Manta sp.) care! The bulk of the presentations include topics like “Elasmobranch touch pools: best practices” and “Pushing the frontiers of elasmobranch capture, transport and husbandry”, as well as numerous species-specific husbandry presentations. If you have the ability to attend, you probably should! This might is a very rare chance to meet aquarists from all over the world who specialize in the captive care and breeding of sharks and rays; the program roster alone with dozens of presentations and topics of interest for the elasmobranch enthusiast. Even if you’ll never have a Manta Ray in your basement pond, there’s still plenty to learn (and dream). Register online for the Elasmobranch Husbandry Symposium by August 20th to get the early-bird rates. CORAL Video: SDC - Brimming with Captive-Bred Sharks! Counting fish based on “reef dandruff"